The two Koreas discussed detailed measures to cease cross-border hostilities and establish a joint fishing zone during military talks on Thursday to pave the way for next week’s inter-Korean summit. The working-level meeting kicked off at 10 a.m. at the North Korean building Tongilgak inside the cross-border village of Panmunjom. The South Korean military said the meeting was requested by North Korea through a letter. 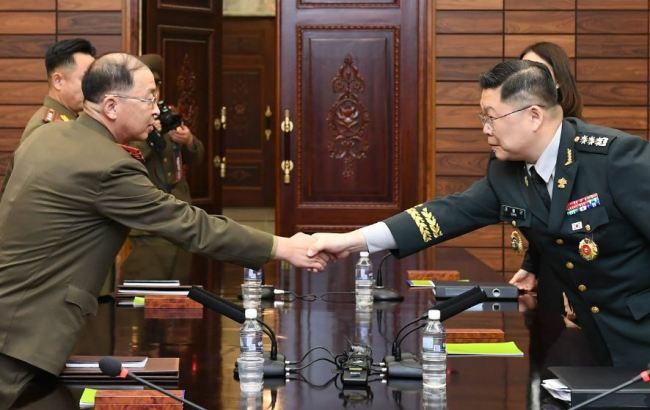 Army Col. Cho Young-keun, who deals with North Korea policy at the Ministry of National Defense, led the South Korean three-member delegation. North Korea also sent three representatives led by Army officer Um Chang-nam, whose rank is equivalent to the South Korean colonel. President Moon Jae-in’s top security adviser Chung Eui-yong said consultations are underway between the two Koreas to prevent accidental skirmishes in the Demilitarized Zone and establish a “peace zone” in the West Sea. “In order to eliminate the risk of war between the two Koreas, detailed consultations are underway to ban hostile activities against each other, prevent accidental skirmishes and establish a ‘peace area’ in the West Sea to ensure safe fishing activities,” Chung said at a security forum in Seoul. Citing anonymous defense officials, Yonhap News Agency reported that the military talks focused on establishing a “buffer zone” in West Sea waters close to North Korea, where the two Koreas have engaged in bloody naval skirmishes. During the April summit at Panmunjom, President Moon Jae-in and North Korea’s leader Kim adopted a joint declaration calling for the two Koreas to completely cease all hostile acts against each other in every domain, including land, air and sea. Those participating in Thursday’s military talks also exchanged views on a “comprehensive agreement on military cooperation,” the details of which are to be announced when Moon meets with Kim in Pyongyang from Sept 18-20. “During the upcoming summit, we will conclude our consultations on comprehensive cooperation in military areas and come up with an agreement for building trust on military issues,” said Chung, who met with North Korean leader Kim last week to arrange the upcoming summit. Chung said the ongoing inter-Korean talks showed the two Koreas are moving toward the stage of “operational arms control,” an idea designed to reduce the possibility of accidental skirmishes by adjusting troops’ deployment or training schedule. To enhance trust in military issues, the two Koreas’ militaries have been discussing the withdrawal of guard posts positioned along the heavily fortified DMZ and the joint excavation of remains from the Korean War buried there. During the general-level meeting in July, the two Koreas’ militaries reached a “broad agreement” on the need for disarming a jointly controlled area at Panmunjom, excavating war remains inside the DMZ and withdrawing guard posts on a trial basis. The two sides, however, failed to come up with a joint statement and a specific timeline for pursing the measures. Both militaries have reportedly exchanged their views through the exchange of letters and working-level contact.